When he plays a techno show, Moritz Simon Geist doesn’t reach for a laptop. 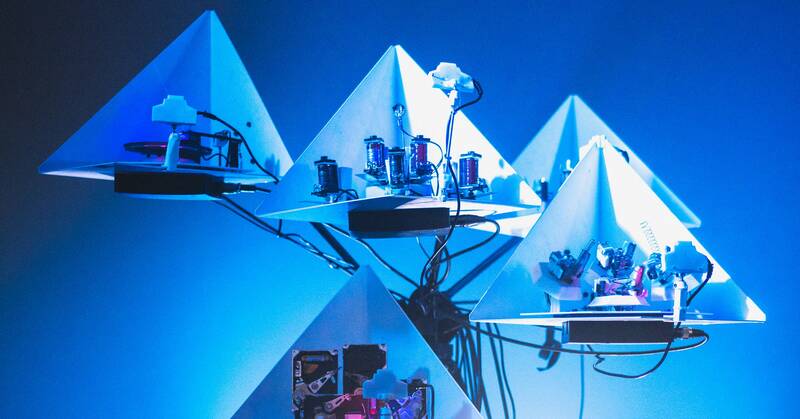 Instead, he calls on his army of sonic robots—a collection of small, motorized creations that click, clank, and whirr in an intricate mechanical symphony. Geist composes robotic electronic music, a burgeoning genre of electro jams that relies on hardware, not software, to engineer electronic sounds and beats. His forthcoming EP, The Material Turn, debuts in October with four tracks made entirely from self-fashioned instruments—futuristic robo-kalimbas, a droning guitar, and salvaged hard drives turned into percussive beat machines. Each of Geist’s “instruments” is custom-made in his workshop in Dresden, Germany. Some are engineered to produce a specific sound, like his take on a kalimba, made from metal pieces and 3-D printed parts. Other instruments come by way of discovery, like finding that tapping a screwdriver against a metal lid makes a pleasant tinging noise. The result isn’t just a dynamic, throbbing album full of electrifying techno. For Geist, it’s a way to push the frontiers of electronic musicmaking. Mechanized instruments have been a curiosity for as long as music-makers could rig together parts. Take the first self-playing piano, the Forneaux Pianista, invented in the mid-19th century. It used air valves to inflate a bellows and mechanically thump on the keys, creating an effect of the piano playing itself. Vaucanson’s mechanical flute player and Phonoliszt’s self-playing Violina would follow, and autonomous instruments remained a fascination throughout the 20th century. As the field of robotics has become more sophisticated, engineers and musicians have developed new ways to incorporate machinery into music-making. Shimon, a robotic marimba-playing robot built at Georgia Tech, relies on artificial intelligence to “improvise” like a jazz musician. In a jam session, it can rhythmically bob its robotic “head” and listen to other human musicians, then tap out a tune of its own. “It’s a combination of old instruments and new robotics,” says van Dijk. Geist had seen plenty of robotic music—bands like Compressorhead, a Berlin-based group that uses a series of humanoid robots to play traditional instruments—but he’d never seen robots in techno. The combination seemed obvious. His first instrument, the MR-808, recreated the sound of a Roland TR-808 drum machine in an enormous, room-sized box filled with traditional drums and robotic parts. It took him three years to build. When he debuted the instrument in an interactive exhibit, Geist realized he’d struck upon something interesting. He quit his job at a research lab, dropped out of his PhD program, and devoted his time to making musical robots. Geist followed the MR-808 with a selection of new and futuristic inventions: The Glitch Robot combined 3D-printed parts with relays, tongues, solenoids, and motors to create glitchy, metallic noises. The Tripods One, which Geist calls a “sonic installation,” is a percussive instrument built from hard drive actuators arms and motors that mechanically ping metal pieces and springs. His latest single, “Entropy,” features a new suite of instruments. A “futuristic kalimba” riffs on the African instrument, made with a circuit board, five metal tongs, and a piezo contact microphone controlled with a Midi keyboard. A “pneumatic hi-hat” blows air into cylinders filled with small styrofoam balls to create a soft percussive noise. Rescued hard drives make a clicking sound, similar to a snare. There’s also a “drone guitar,” built by attaching a motor to an electric guitar, and an instrument Geist describes as “crazy psychedelic glasses,” which uses a motorized arm to clink on beer glasses filled with different amounts of water so they’re tuned to various pitches. Watching him play “Entropy,” you see styrofoam balls float up on puffs of air, while LED lights blink on the futuristic kalimba. The motor fingers the guitar strings like a disembodied hand. Sure, the requisite electro-techno strobe lights and bass-heavy beats feel familiar. But with his sonic robots, Geist manages to do something increasingly rare in electronic music. When he plays, he keeps all eyes locked on the stage.